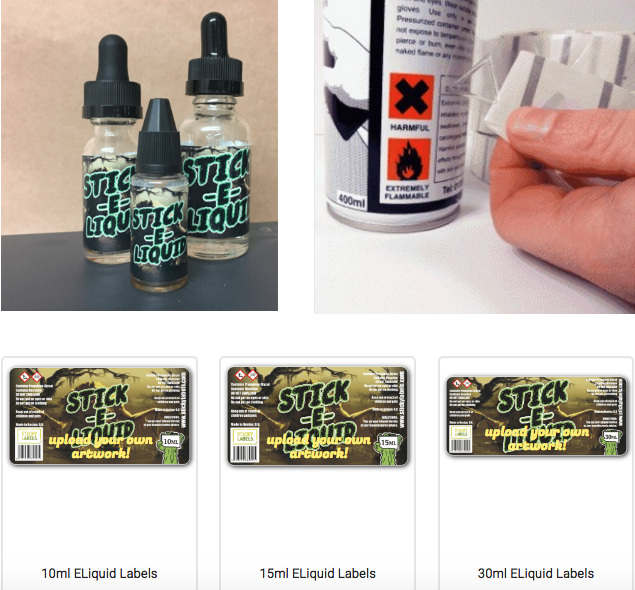 Looking for e liquid stickers to ensure your vape bottles look great and comply with UK Law? Vaping is big business, not just in the UK but around the globe. As the popularity of vaping grows, so too do the rules that companies have to adhere to and considerations like the E-Liquid Labels on the bottles are extremely important and legally required to state a lot of information… If you want to know more about what information is needed on e liquid bottles then read our blog about that here. If you understand that and simply want to get your labels printed then check out the three options we have for you here… and remember we can print most labels within 2 working days and send them out to you incredibly quickly. 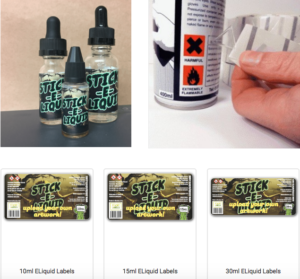 Creating labels for your e-liquid is easy: We’ve created basic size templates with a few simple options so you can create your adhesive stickers in minutes! With the stickers being waterproof vinyl, they won’t stain or become damp and fall off, plus they will be full colour so you can add any design you’d like! Before you order anything, please ensure you measure your bottle to get a good idea of the sticker size required. You can save a lot of time and expense by making sure the label is correct before committing to making a purchase! If you already have a label design that contains all the information required then it’s easy to upload that and get it printed to the size you require. By default we have sizes for 10ml / 15ml / 30ml. You can select your size, upload your image and even add a barcode if you want to. There is, of course, limited room on the sticker and a lot of information to consider, so please ensure that you have your label correctly designed before printing… Though we will proof-read these before printing! If you’d like a custom sticker shape or size then visit our vinyl label quote page, fill in the details and let us get straight back to you. We can do the work for you provided you have a basic design for the background and we’ll help every step of the way. This is great as the labels will be full colour, long-lasting vinyl. Obviously, the stickers are waterproof so any spillages of the e juice won’t affect them. It’s easy to add your designs and we supply them on a roll so you can either apply them by hand for small volumes or use a machine for application on large volumes. It may be easiest and more convenient to simply call us and let us know what you require. 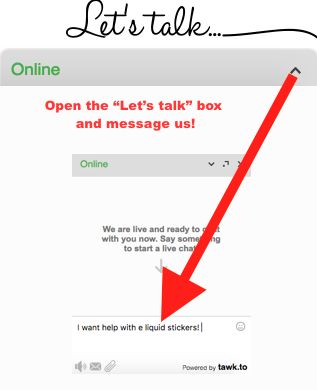 Or you can use the convenient live chat if it’s within working hours. We can answer any questions you have about custom label sizes, prices, whether the stickers will be on rolls or in a dispenser, we can quote prices or even arrange faster print and delivery in an emergency. Certainly, for the custom print work, we will be happy to help so you can be sure there are no mistakes or unnecessary expenses! Come and pick our brains and get labels for your e liquids that look slick, professional and won’t fall off or stain!